But he drops a hint about running for president. Chris Christie ran into a buzz saw at his latest town hall meeting on Tuesday, held in the Middlesex County town of South River. It was his 114th such meeting since taking office, and he came loaded for bear—having already discovered at last week’s event that his many-faceted opponents in New Jersey planned to show up and make their voices heard. And so they did. Whether the beleaguered governor’s ability to run for president in 2016 will be helped or hurt by today’s troubles at the town hall meeting aren’t clear. Clearly, to get the GOP nomination, Christie will have to appeal to the Republican base, from the Tea Party far right to moderate conservatives, and many of them will approve of his bullying confrontation against New Jersey unions and public sector workers. But, at the end of the event, speaking to a young student in the audience, Christie did drop a hint that he sees the White House in his future. Asked to comment on the future of New Jersey, Christie got around to saying: “My guess is, ten years from now I’ll be retired from public office.” Of course’s he’s term-limited, and he can’t run for governor again—something he’d already pointed out during the event. But, if he does run for president and serves two terms, he’ll leave the presidency in 2024—exactly ten years from now. Maybe that’s on his mind? In any case, before taking questions, Christie issued a startling and unusual warning to the 350 people or so who’d lined up hours before the 11 o’clock start. After saying that some people might believe that “today is the day to show off, to yell and scream at the governor of New Jersey, [and] I don’t respond to yelled questions,” Christie added that he’d was prepared to deal with what he expected to be a planned intervention at Tuesday’s town hall meeting, “a new phenomenon brought to you by the Communications Workers of America, the public-workers union,” which he described as “the people we have been standing up against for the past four-and-a-half years.” The CWA, he added, his tone dripping with disdain, are “the people who want more and higher taxes.” He continued: “We are not going to raise taxes…just to give more and more benefits to the CWA.” He was on a roll: “They failed at the polls against us in 2009, and again in 2013.” Now, he predicted that they’d turn up and “yell and scream” to disrupt the event. “They have decided to be a disruptive force at town hall meetings,” he said. Adding that, if they did, he’d have them ejected. And then he took his jacket off. Governor Christie, we are here to demand you stop your corrupt uses of Hurricane Sandy money! There are still families without homes who have received no aid. And yet Boraie Development is receiving millions to build luxury apartments in New Brunswick. You continue to ignore the need of the people you serve. New Jersey needs are more important than your political ambitions. Outside, in an interview with Christie Watch, Collinsgru complained about Christie’s refusal to let New Jerseyans know what’s available. 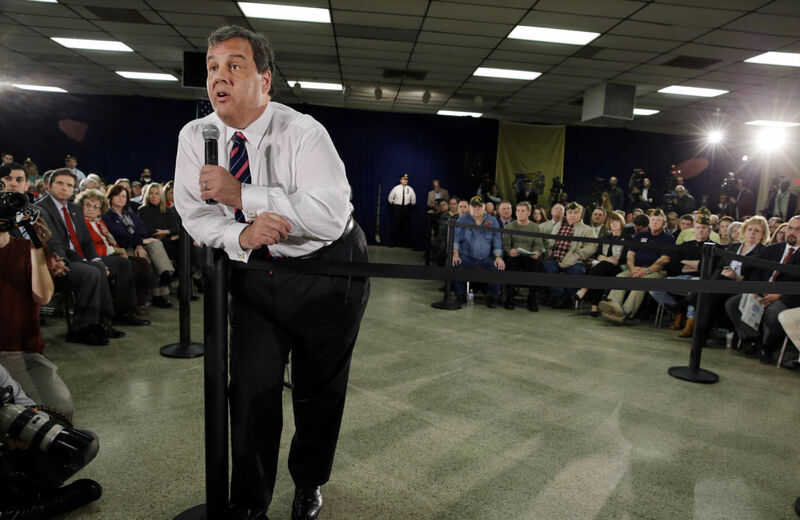 “Christie has taken a totally hands-off approach,” she said. “He’s been totally silent when it comes to informing the people of New Jersey about the benefits of coverage.” As a result, organizations such as Citizen Action, with a much smaller megaphone, have taken it upon themselves to let people know about federal and state programs—especially with the March 31 deadline for signing up under the Affordable Care Act approaching. There were other protesters, too, along with the usual contingent of people petitioning the governor for help, especially about reconstruction post-Sandy—which, Christie pointed out, left 365,000 homes in New Jersey damaged or destroyed. But, as he outlined in his budget address last month, he’s committed to yet another round as the centerpiece of his economic plan. Expect more protests. CORRECTION This post has been corrected to reflect the fact that Wolff & Samson, the law firm co-founded by David Samson, chairman of the Port Authority and key Christie ally, represented New Jersey's Economic Development Authority, and not Boraie Development LLC, in the New Brunswick development of a controversial luxury high-rise building.